Early on in the piece shaping machines copped a good flogging. Muzza walks us through the evolution of the shaping machine and how it has transformed shapers into designers. 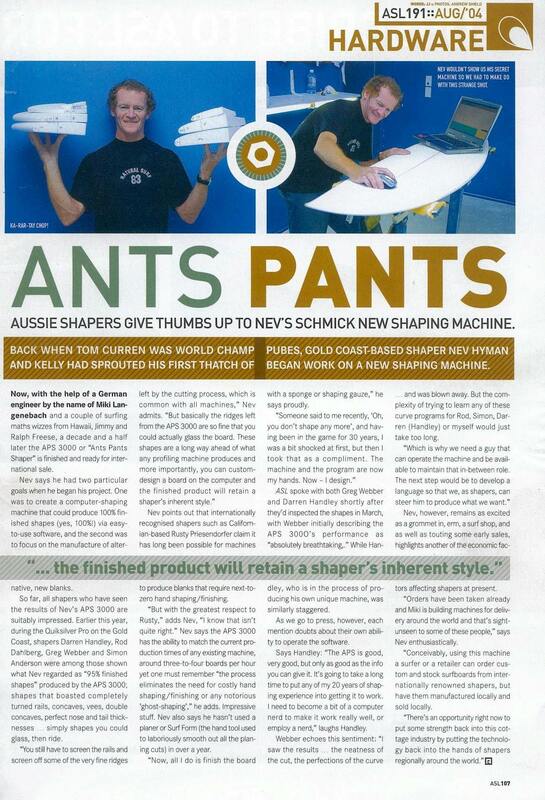 Murray Bourton walks us through how the APS 3000 Surfboard Shaping Machine has aided in the evolution of the shaper to the designer. and then there is this little video, check it out here . Recently we did and interview with Cadalyst (Computer Aided Design Magazine) magazine which gives a brief over of the APS3000 system and talks about the interesting stuff going on with Peter "Chops" Lascelles and an APS3000 in Newquay, UK. Also, a related article about what Chops is doing in the Conwall Pure Business Magazine. An article about his turnaround towards to computer design and machine shaping. "Brooko's (Troy Brooks WCT Surfer) telling me that my success rate with his boards has more than doubled and Munro (Luke Munro WQS) says the same." "To fully answer the line of thought that shaping machines are a removal of skill I have to say that it is the time and thought that goes into designing your board must be energy better spent than time in the bay." "In concluding I hope that this explanation to pacify the sceptics of my final acceptance of the embracing of this new technology is not to save dollars but to move forward in giving my clientele the benefit of more modern, accurate and customized designs than ever before." Steve's experience with the APS3000 shaping system (.doc format). Highly innovative and free thinking shaper Dave Verral (Feral Dave) has been recently doing some very creative designing with our program. His designs are at feraldave.com. When I was first shown the surfboards cut from the APS3000 I was blown away! All up it took me around 6 surfboards to make them look like what I had been making for the last couple years only more even and accurate! ... The thing I really enjoyed was that no two surfboards had to be the same any more ( I didn't have to get 3 cut at a time all the same in a mass produced kind of way) now every board was a custom designed with the individual in mind. ... My whole life around my work has changed I can now spend time with my customers designing their personal surfboards a much less time wrestling with the planer and templates. Top Peruvian Shaper Wayo Whilar (his info) had the following to say about the APS3000 system. After making some boards with this new tool, I realized the amazing limitless possibilities of this great software and machine. Master surfboard designer Greg Webber (riders include Taj Barrow plus a whole slew of rippers) is one of our very good customers and has recently added what's below to his website, Greg Webber Surfboards in reference to our machine. The existing machines, although great for accuracy and production, are not custom friendly at all. By using an incredible machine that has just been perfected, merely drawings and/or words can become a balanced shape.